Mona Poetica: A Poetry Anthology – Diane Shipley DeCillis and Mary Jo Firth Gillett, eds. The Mona Lisa is the most famous painting in the history of art. It continues to inspire reproduction, parody and countless theories. We see facsimiles of it everywhere: on buildings and mugs, on computer ads, in cartoons. 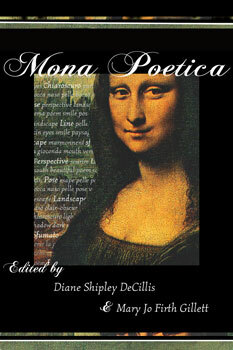 In honor of her 500th birthday, 2003-2006, Mona Poetica celebrates not only the painting but also inspiration and creativity. This rich and varied anthology includes work by: Stephen Dunn, Grace Bauer, William Blake, Edward Hirsch, Natasha Saje and many others.